The new leaders of the Premier Division supported by Sportsform league table are Shefford Town & Campton following their 3-1 victory at Flitwick Town. Lee Harman netted twice and Kier Boyd once against a lone Town reply via Dominic Collins. However just a point behind in second and third and with a game in hand are Cranfield United and Ickwell & Old Warden. United made it three wins from three with a 3-0 home success over Stevington thanks to goals from Countney Boughton, Niall Jones and Daniel Green whilst Ickwell & Old Warden did likewise in winning 4-1 at AFC Oakley M&DH. Sheldon Washington with a brace was joined on the Ickwell scoresheet by single strikes from Marko Tobdzic and Paolo Grasso against a lone home reply from Nathan O’Halloran. Now in fifth and still unbeaten are Queens Park Crescents who chalked up the biggest win of the day with a 8-0 home win over Sharnbrook. Tim Larrier led the way with a hat-trick, Mohammed Raheem Jabber netting twice and single goals coming from Shahinur Rahman, Ismail Rakhman and Mohammed Abbass. Whilst in sixth are Wilstead who ran out 4-2 victors at Caldecote. Paul Jones, John Steele, Ryan Davenport and Sean Harrod netting the goals to do the damage against home replies via Chris Richardson and Nick Thomas. For eighth place Crawley Green Reserves it was a 3-0 victory at AFC Kempston Town & Bedford College thanks to goals from Dominic Horne, Mark Smith and Milton Tomlinson-Dennis. hilst Marston Shelton Rovers claimed their first win of season with a 2-1 victory at Riseley Sports - Harry Baker and Sam Abbott on the Rovers scoresheet against a single home reply via Jack Healy. Also winning for the first time this season were Renhold United who required just a goal from Wes Lewis to win 1-0 at Wootton Blue Cross. With overnight leaders Shefford Town & Campton sitting the afternoon out they fell to fourth and saw their leadership taken over by Cranfield United Reserves who maintained their seasons unbeaten ways with a 3-0 win at Chrisitians in Sport (Luton) thanks to goals from James Kelly-McLellan, Joe Bygraves and Joe Sames. Whilst just a point behind in second are The 61 FC Luton Reserves who ran out 5-1 home winners over Farley Boys. George Onwusonye with a brace was joined on the 61 scoresheet by single strikes from Farrell Whitman, Shea Gentle-King and Ashley Prospere to bring up the nap hand against a lone reply via Aaron Randall. Just goal difference behind in third are Wixams who required an own goal from James Fay just 21 seconds from time to claim a 3-2 home win over Cople & Bedford SA. Hadley Ling and Grant Tibbett scored the earlier home goals against replies via Ollie Highes and Gary Canxano for the visitors. The result of the day belonged to Lea Sports PSG who emerged the 3-1 winners at last season’s champions Totternhoe Reserves. Warren Bell netted twice and Rhys Cadger once against a lone Totts reply from Jonny Clarke. In the local derby action at Groveside it finished 1-1 between hosts Henlow and the visiting Sandy. Alex Toye scored for the hosts with Nicky Threadgold on the Sandy scoresheet. Elsewhere, Biggleswade FC Reserves went nap in claiming a 5-3 home win over Flitwick Town Reserves. Tom Cookman with a brace was joined on the home scoresheet by single goals from Kian Coles, George Holman and John Veal against Town replies from Pete Rogan with a brace and a single strike from Sam Johnson. The Wilstead Reserves v Bedford Albion game was postponed due the the unsafe state of the hosts’ Jubilee Playing Fields pitch. Still 100% for the season and sitting on top of Division Two are Atletico Europa. However they were taken to the wire by the visiting FC Kokan before a 85th minute goal from Moses Gilson took the hosts to a 3-2 victory. It was the visitors who took the lead in the 24th minute via Shaahid Bangaroo. It was to last just eight minutes until Gilson levelled for the hosts who then, within a minute, were behind again via a strike from Simonas Veverskis until Paddy Alimanji with a spectacular overhead kick made it 2-2 in the 37th minute. That’s the way it looked likely to stay until Gilson struck five minutes from time to deny the visitors a much deserved share of the spoils. In second spot and still unbeaten are Meltis Albion who won 5-2 at home against AFC Oakley M&DH Reserves. Dan Smith with a brace was joined on the Albion scoresheet by Sahr Songa, Stanley Gonese and Aaron Wright against single strike replies from Ollie Haylett and Rhys Allen. Whilst third spot belongs to Clifton who ran out 4-1 winners at M&DH Clapham Sports - Dale Houghton with a brace plus an own goal and a single goal from Dylan Donaldson only being replied to once by Phil Kempsell for the hosts. The biggest win of the day went to the still 100% for the season Sporting Lewsey Park who won 8-1 at Marston Shelton Rovers Reserves. Adrian Fontennelle and Chris Gibson grabbed hat-tricks and were joined on the Park scoresheet by single goals for Lee Mooney and Luke Lincoln against a lone Rovers reply from Lorenzo Jordan. Whilst also winning big on the road were Kempston Athletic 6-0 at CS Rovers. Craig Damon netting twice and supported by single strikes from Ashley Mattin, Gary Whitbread, Luke Mongiovi and Alex Larkin. 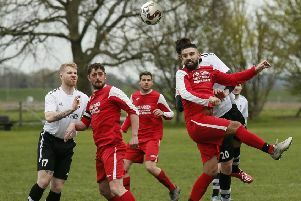 There was also away wins for Houghton Athletic who, with two goals from Mihall Tudos and single strikes from Josh Barnette and Gavin Watson, won 4-0 at St Joseph (Saturday) and also for Luton Leagrave AFC who with goals from Matt McMillan and Melvin Uzomah were 2-0 winners at Sundon Park Rovers. Elstow Abbey retained their unbeaten ways in claiming a 6-0 home win over Caldecote Reserves. Jason Allison with a brace was joined on the Abbey scoresheet by single goals from Travis Joseph, Mark Keech, Aiden Powell and Scott Joseph. Whilst Black Swan were gifted the three points when Unite MK Reserves failed to raise a side to travel into Luton to meet them. Still sitting on top of Division Three are Pines (Luton) who remain 100% for the season after winning 6-1 at Stevington Reserves. Ryan Smith led the way with a hat-trick, Nathan Miller netting twice and Gary Duncan once against a lone home reply from Tom Filipzak. Whilst second place Wixam Wanderers were beaten for the first time this season in going down 4-2 at Real Haynes. Hayden Dormer with a brace plus an own goal and a strike from Tyler Winter on the home scoresheet against Wanderers replies via Michael France and Thomas O’Neill. In third place, leading a batch of five teams on six points, are Harlington Juniors who were 3-2 home winners over Flitwick Town A. Addi Martins, Andi Fildes and a Kevin Lambert penalty outscored Town goals from Josh Arthur-Kent and Mark Bartlett. Whilst in fourth place are Wootton Village the 5-3 away winners at Sandy Reserves, Aqeeb Hanif netting twice alongside single goals from Nick Burraway, Tommy Evans and the debutant Ben Hall against home replies via Jack Fox and Jack Webb. It was a return to winning ways for Shefford Town & Campton A who emerged the 3-1 home winners over FC Polina (Luton) Bradley Vought, Michael Castle and Ben Sheehan on their scoresheet against a lone reply via Igor Zieba. Whilst Thurleigh claimed their first win of the season in a 4-1 home victory over Square FC. Bradley Raines, Ethan Potts, Sam Greco and the evergreen Kevin Harris netting the all important goals against a lone reply from a Nathan Davies penalty. Elsewhere it was a share of the spoils for hosts Dinamo Flitwick and the visiting Bedford Albion Reserves from a 2-2 draw. Alex Sommers and Dale Goldie netting for the hosts and Harry Spilliane plus Matt Phelan replying for the Albion.